An average broadcaster today has to balance two contrasting realities to make its business work profitably. One is transitioning to digital, tapeless, file-based and IP workflows – simultaneously or in lock-step with each other – and the other is to manage the business side and make content available for a variety of screens, device types, and networks, on-demand and anywhere. These two imperatives are seemingly disparate, yet highly intertwined. Most often, restrained by limited budget and resources, companies focus on specific point solutions that help them take care of immediate needs, forcing them to scramble to build and/or buy components sub-optimally just to keep their heads above water. However, in doing so, these companies, though taking care of a tactical challenge, actually add more complexity and miss the strategic business imperative. Such siloed deployments aimed more on certain aspects of the underlying production workflow, are often isolated from the larger organizational perspective, inevitably hampering collaboration and interoperability between different functions, systems, and knowledge workers.This leads to longer cycle times, resource redundancy and effort duplication around the workflow, and sub-optimal investments in unviable products as well as processes – something that a media company can ill-afford. Many broadcasting companies have implemented media asset management (MAM) to manage the content assets within a highly collaborative production workflow, and facilitate content discovery, production and repurposing, and, in so doing have experienced tangible benefits. MAM can eliminate redundancies as well as ensure higher level of quality check (QC) at every step of the process. Importantly, it can help achieve cost savings and efficiencies by empowering collaboration, cycle time acceleration, intelligent discovery while reducing redundancies, and the cost of lost or misplaced work among others. 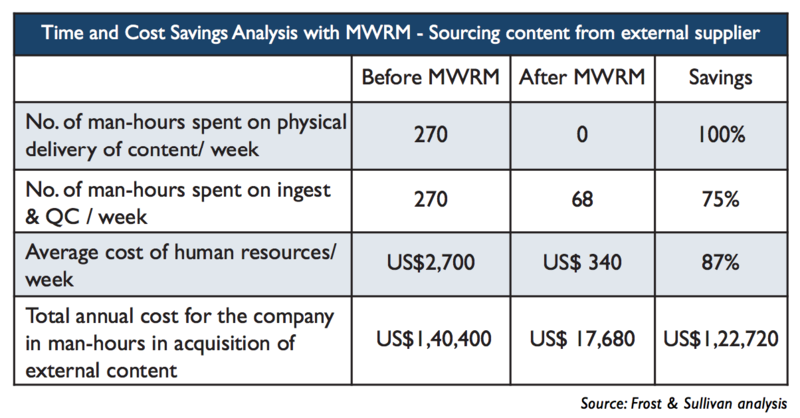 Frost & Sullivan did an analysis of the time and cost savings for just content acquisition from external suppliers for one program series per week. Needless to say, such tasks and similar ones, repeat through the workflow. Hence, if applied, MWRW multiplies the benefits several times over, especially for a programmer who collates and distributes numerous programs. This recently released white paper, entitled “Media Workflow and Resource Management: The Roadmap to Revenue Growth and Reduced Complexity,” analyses the key challenges faced by media companies, especially television programmers, to not only manage their growing content bank but also the business processes and ecosystems tied to the same. This paper also, using illustrative examples, explore feasible solutions that can enable content companies to alleviate enterprise-scale workflow concerns, while reaching the widest audience possible and reap profits. You can download the white paper for free from the Frost & Sullivan website.